What do you need to know about Ruby on Rails? Ruby, which was developed more than twenty years ago, is one of the most popular programming languages today. Ruby on Rails is a free open source framework (like many other popular frameworks, it’s distributed under the MIT license). The Rails framework helps developers build websites by abstracting and simplifying repetitive tasks. Ruby on Rails is based on the Model-View-Controller (MVC) design pattern. 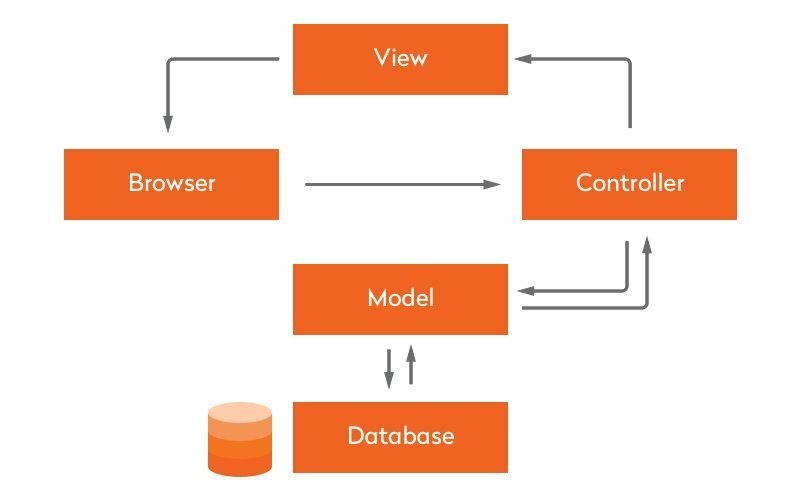 The MVC pattern supports parallel development, which means that multiple developers can work on the same app simultaneously, with each working on a separate piece of functionality. What are the advantages of using Ruby on Rails for web programming? 1.Ruby on Rails is easy to read, comprehend, and work in because it’s close to a natural language. Ruby on Rails is really close to English, but it also uses its own domain-specific language that extends Ruby’s semantics. Often, domain-specific languages end up being too complicated, but the team behind Rails has found a good balance by using domain-specific language only in certain instances so it doesn’t make the framework difficult to understand. 2. Ruby on Rails has a rich collection of libraries that facilitate and speed up development. The philosophy behind Ruby on Rails is often described by referring to the software design paradigm convention over configuration. This implies that the framework is composed in a way that decreases the number of decisions that a developer has to make while keeping the framework itself flexible and easy to customize. Ruby on Rails has multiple reusable, easily configurable components that can be used to cut down development time. Generators in Ruby on Rails allow you to automate basic CRUD functions, while libraries, appropriately called gems, can be used to implement typical features such as authentication or payment integrations. Another powerful tool that Ruby developers can use is the module. Modules provide help you organise Ruby classes, methods, and constants and unites them into groups or units. Writing a module is similar to writing a class, except that a module starts with the module keyword instead of the class keyword. 3. Ruby on Rails has options for test automation. Ruby on Rails has an option for integrated testing that checks the quality of code as it’s being written. This means that there’s less need for third-party testing tools. Rails creates a test directory for you as soon as you create a Rails project using rails new application_name. By default, every Rails application has three environments: development, test, and production. It’s possible to run all of your tests at once using the bin/rails test command, or it’s possible to run a single test file by passing the filename containing your test cases to this same command. 4. Ruby on Rails is mature and stable. Ruby on Rails provides opportunities for code refactoring and lets developers extend their apps by adding new features to existing code. This framework has well-established coding conventions that make it easy for new developers to join projects that have accumulated a lot of legacy code. Ruby is good for scaling a product. First of all, Ruby supports caching out of the box, meaning that you can view fragment caching within your your app’s code and also use Redis as a cache store. You can also use a remote multi-server automation tool such as Capistrano, which automates pushing of new application versions to your deployment location. Rails also lets you use the cloud infrastructure framework Chef, which itself is written in Ruby. Chef can help you manage infrastructure dependencies, create folder structures, and bootstrap the entire system or update system configurations with a minimum of commands. Another thing that makes Ruby on Rails a good choice for a project that needs to scale is the way it works with background jobs. Enqueueing tasks such as email confirmations after new users register in the system is important for a smooth user experience, and the bigger your product is, the more crucial background jobs become to its functioning. In Rails, it’s possible to set up background jobs using Sidekiq or Resque. What projects will particularly benefit from Ruby on Rails? Ruby on Rails is optimal for e-commerce app development because of its modular approach to website development. Ruby on Rails also lets you do bulk image and product uploads and update product descriptions en mass, which is useful when you manage a large e-commerce website. Other features that can be easily implemented with Ruby on Rails include custom pricing algorithms and options for automated image resizing and cropping. There is a number of open source solutions built on Ruby on Rails specifically for e-commerce app development. Spree is one example; it’s open source and API-driven and has an active community of developers who have been contributing to it on GitHub for 11 years. Ruby on Rails provides a variety of plugins that can be used to implement all crucial features for social networking websites. Multiple open source libraries written in Ruby on Rails let you develop a social network faster and more easily than building it all from scratch. For example, social_stream supports contacts, posts, file uploads, private messages, and other features. Ruby on Rails has a lot to offer CMS platforms because of how easy it is to scale apps written on it and how reliable and easy to navigate Ruby on Rails websites generally are. Refinery is one of the most popular Ruby on Rails-based CMSs; it’s multilingual, gives you a lot of flexibility in design, and has an active community of developers who support it. Camaleon is another popular Ruby on Rails CMS, and is often called the Ruby on Rails alternative to Wordpress. It has a wide number of features including support for widgets, shortcodes, and custom fields. Camaleon also lets you group your data into content groups and provides its own plugin library for developers. Overall, it’s noticeable that Ruby on Rails as a web development framework has reached maturity and will likely grow to become even more stable, which together with its scalability makes it a good fit for enterprise-level applications. The committed community of developers who constantly contribute to its open source libraries guarantees that Ruby on Rails will remain a top choice for many types of web development in the coming years.